The WSOP Main Event might have been the talking point for many in Las Vegas this weekend, but in a quiet corner of the Aria Casino,Brian Rast was busy taking down an all-star high roller. Forming the final part of the Aria and Poker Central's Super High Stakes Series, the $500,000 tournament welcomed many of the game's top players, including Phil Hellmuth, Daniel Negreanu and Scott Seiver. In total 43 players ante-up for a shot at the lion's share of a $21.5 million prizepool, but at the end of the day only seven would walk away with a return on their investment. First to fall at the final table was Erik Seidel and he was followed by Tom Marchese, David Peters and Timofey Kuznetsov. With the bulk of the field now watching from the rail, Rast was able to kick his game into gear and eliminate Conner Drinan. That elimination set up a heads-up showdown between Scott Seiver and Rast. Leading the way with a 2:1 chip lead at the start of play was Seiver, but that was quickly reversed by Rast. With the bit now between his teeth and a chance to take out Seiver when he moved all-in with pocket fives, Rast made an all-in call with As 9s. Flipping for the title and more than $7 million, the two players watched as the board rolled out: 9d, 2c Qh Kd 6d. 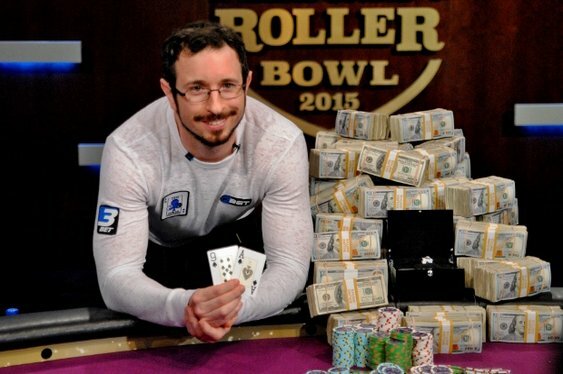 The configuration gave Rast the pot, the inaugural Aria Super High Roller title and a career best win of $7,525,000.